For quite some time, V2 Cigs has a big player in the electronic cigarette world; over the last couple of years, they’ve turned a lot of their attention to the vaporizer world. 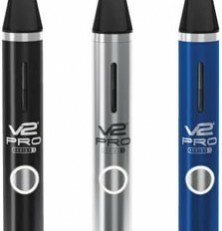 The V2 Pro Series 3 was their first tank offering and is still their most popular, as it provides an easy introduction to vaporizers for both regular users of traditional e-cigarettes and those vaping for the first time. The Pro 3 has a rather unusual look for a vape pen; it’s built to be a “one piece” unit (plus a mouthpiece). The battery is contained in a cylinder (in your choice of blue, black or steel) with an open space at the top. The tank/atomizer assembly slides into that open chamber and is then secured by a magnet rather than needing to be screwed in and out. (You do have to unscrew the mouthpiece to add e-liquid, though.) The V2 Pro Series 3 is designed to look modern, and it does. The one major objection we have to the design is the mouthpiece; it’s pyramid-shaped (for want of a better description) with a slippery finish, and we found that our lips continually slipped off of it when trying to inhale. Quite frankly, it stops us from using the device more often. The other negative, to our mind, is that we have to hold the ecig under a bright light in order to clearly see the ejuice level through the small indicator window. One feature of this product which should definitely be highlighted: it’s one of the only vaporizers of this size specifically built to efficiently vape loose leaf substances, essential oils and waxes as well as e-liquid. There are specially-built cartridges for each, and they perform extremely well because of the Pro 3’s design – each cartridge has a different contact point with the battery, so the device is able to determine the right temperature for leaf, wax or liquid vaping – and reaches that temperature quickly. The system is more efficient than most vaporizers, which either need a lot of time to heat the wax or loose leaves, or burn the leaves to a crisp. And since the entire cartridge is easily removed, it’s a snap to clean out. The only major drawback is that the starter kit only comes with the liquid tank; the wax and loose leaf cartridges are an extra $25 apiece. It should also be noted that the relatively small loose leaf cartridge won’t hold a large amount of material, so you may find that you have to repack it frequently. The V2 Pro 3 vapes nicely, with a good amount of vapor on the inhale (although as mentioned earlier, we found it hard to lock our lips around the mouthpiece for a good, solid drag) and good clouds on the exhale. The throat hit was moderate, not as strong as we’d prefer but still with a decent bite. Unfortunately, there’s no variable battery available with which you could boost the power on this unit to play with the size of the hit; the entire vaporizer is sold as one unit. The starter kit includes only the vaporizer (which comes with a 650 mAh battery and the 2.0 ml e-liquid tank/atomizer unit) and a USB charger. Add-ons like wall or car adapters are extra (and of course, as with all tank systems, you have to buy your own juice). It’s a very well-built product with no liquid leakage detected at all, and feels good in the hand. Refilling the V2 Pro is extremely easy as you just pull out the cartridge (held by a magnet) and unscrew the mouthpiece. One negative is that V2 doesn’t sell replacement atomizers for this unit; you have to replace the entire cartridge which would get costly over the long run. V2 doesn’t sell an enormous range of e-juice, just the same flavors they use in their regular e-cigarettes – tobacco, menthol, coffee, cherry and so on, in strengths up to 24mpg. But the quality of the liquid is quite good in most cases, and of course you aren’t restricted to the company’s juice. We did find some things we didn’t like about the V2 Pro 3, but there’s a lot arguing in its favor – particularly if you want to vape loose leaf or wax in addition to e-liquid. It’s a good starting point for those “moving up” in class to a personal vaporizer. Get 15% off all V2 Cigs kits with this exclusive coupon code. We check online daily and this is the biggest discount available. Just click the button to your right, and then use the code when you check out. Discounts work on all sale merchandise, too, so you can add to your savings when you shop the V2 site. Get 10% off all V2 merchandise with this exclusive coupon code. We check online daily and this is the biggest discount available. Just click the button to your right, and then use the code when you check out. Discounts work on all sale merchandise, too, so you can add to your savings when you shop the V2 site.